John Eta was born and raised in Kumba, Cameroon, Africa. His father’s strongly held belief in the power of education has stayed with him all his life. He has long had a dream of increasing the access to books and learning opportunities for students in his home town. 2002: an idea was born at King’s College School in Caledon. John Eta, the Managing Director of the School and his business partner Barbara Lord, the school’s Headmistress were discussing what project the senior students could undertake to fulfill one of their leadership goals of contributing back to the world. The students liked the idea and collected books and raised funds. Thus the Cameroon Library Fund was born. 2003 – 2005: Since then King’s College School has continued the fundraising and book collection drive. In Africa this translated into a learning centre where local students could come to study and the development of the largest private library in the Kumba area. July 2005: The senior class traveled to Kumba, to deliver more books and 2 computers to the learning centre. There were 6 students, 2 parents, Barbara Lord and John Eta. Pat Long was one of those parents and she has continued to participate in the fundraising effort since then. September 2005: Eta College, Kumba, A school for Bright and Gifted Children opened with 8 students in Form 1. 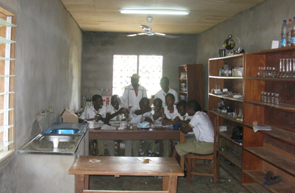 The school is situated on the Eta Family compound and has room for about 60 students and three forms. September 2006: Eta College enrollment is 20 in Forms 1 and 2. March 2007: John Eta traveled to Kumba to review plans and initiate the construction of a new school, to be built on the Eta property. March 2007: John Eta traveled to Kumba to review plans and initiate the construction of a new school, to be built on the Eta property. Funding for construction is also donated by Benesure Canada Inc.
July 2007: John Eta returns to Kumba for teacher training and Pat Long joins him there to deliver a computer for administration and monitor progress on construction of the new school. September 2007: Projected enrollment is 29 in Forms 1, 2 and 3. September 2007: Projected enrollment is 60 in Forms 1, 2 and 3. September 2008: New school opens and includes Forms 1 – 4. Enrollment growth will be controlled to prevent massive readjustments each year with staff and existing students. Because there is such a change in learning methodology for the students, enrollment growth is controlled by adding new students to Form 1 only. This is to prevent massive cultural readjustments each year with staff and existing students. March 2009: John Eta returns to review operation plans and provide further training to staff. February 2010: John Eta, Pat Long and two volunteers visit the school to oversea further teacher and staff training. Spring 2010: The Cameroon Ministry of Education publicly endorsed our Integrated Sciences and Integrated English curriculum at the annual Education Forum held by the Cameroon Government. June 2010: Eta College – Kumba students wrote O-Level (Form 5) exams for the first time. Two of our graduates ranked in the top 15 in all of Cameroon. It was the first time in the history of Kumba that any local student had ranked in the top 15 in the country and we had two. August 2010: John Eta visits the school to facilitate a change of personnel in the administration. Mr. Ojong is promoted to Principal. Fall 2010: We added music and art to our curriculum. This is not available at any other local school. April 2011: A highly successful Tastes of Africa, hosted by King’s College School raises enough funds to purchase a vehicle for the school. In combination with a donation from the Klein Panneton Foundation, the balance of the funds will go toward the purchase of a bus. June 2011: A container organised by King’s College Students and Charity volunteers and filled with books and additional supplies for the school leaves Canada for Eta College - Kumba in Cameroon. A donation from the Alva Foundation supported this project. June 2011: Through Benesure Canada Inc.’s donations, finishing touches are added to the building to make it safe for use and to protect the stairs from the rains. July 2011: John Eta visits Cameroon to facilitate receiving the container and provide teacher training. September 2011: New School year starts with a fully equipped science lab provided through the generous donation from Manulife Financial and a new Computer Lab. Several used laptops were sent on the container. March 2012: Pat Long and Andrew Beaudoin visit the Eta College - Kumba for oversight of financial procedures and to deliver computer training to both teachers and students. Andrew installed self-learning modules on all the computers. April 2012: Tastes of Africa fundraiser was once again successful and raised enough money to purchase a 19 seat school bus. This is especially useful for the students who live an hour away on foot as school begins at 7:30AM. May 2012: Our Form 5 students wrote their O-Level GCE exams. As we do not have GCE Status yet, our students wrote their exams at Denis Comprehensive School in Kumba and the top two students in that group were from Eta College. August 2012: Mr. John Eta travelled to Kumba to deliver teacher training and to observe the process of opening the school in September. Several team initiatives and reporting requirements were implemented. November 2012: A staff fundraiser at Benesure Canada Inc. raised enough funds to purchase musical instruments, video camera and memory sticks. 2013: A motorcycle is purchased to facilitate the outreach programs. One of the staff visits the feeder schools to share, inform and educate the other schools. April 2013: Another successful Tastes of Africa fundraiser was held in Caledon. 2013: A photocopier is purchased. Textbooks are at a premium and as a result textbooks are photocopied. October-November 2013: Tabot Eta performed a procedural audit and from this audit some changes were implemented and several development projects identified. April 2014: Taste of Africa fundraiser is held again in Caledon. 2014: A fence is built around the school to ensure the safety and well-being of the staff and students. 2014: The school is now a certified GCE facility. April 2015: Taste of Africa fundraiser occurs in Caledon. May 2014: John Eta visits the school to facilitate a change in personnel. Jan 2015: John Eta visits the school for further training and the start of construction. 2015: A new vehicle is purchased. August 2015: John Eta again visits the school to oversee the construction, training of staff in anticipation of the new school year and general administration. 2015: The second and third floor is constructed to help with the increase of the enrollment. A designated lab, computer room and library are created along with new classrooms. Jan 2016: John Eta visits the school to implement changes in the progression flow of the students and implement changes in evaluating teacher performance. Summer 2016 - John Eta again visited the school and hired any necessary teachers, trained and reviewed Z4 and had the teachers begin the curriculum mapping. 44 new students started in September. Summer 2016 – Work began on having electricity to the apartment and the lab. Security lamps were added. The major project was having a generator installed and having a new well to ensure a steady flow of water. Fall 2016 – The nutrition lab was outfitted and doors and shutters were also installed. The process of starting a Primary School has begun. This will allow a stream of students from Primary all the way through to graduation. Dec 2016 - Jan 2017 – John Eta travelled to Cameroon and worked with the staff members to prepare for the high school. We hired a mathematics specialist and tutor to make the school the Centre of Excellence in Mathematics. Spring 2017 - The science lab stations were enhanced to operate to university standards. Spring 2017 –The students were able to write their GCE’s and Eta College International had 100% pass rate. It was the only school in Cameroon to do so. Summer 2017 - John Eta went again to Cameroon. John worked with the teachers on the Z4 program. Fall 2018 – The science lab was outfitted and our first group of Upper Preparatory (Form 6) students were able to take advantage of the lab. Fall 2018 – Winter 2018 – John Eta went to Cameroon. While he was there he spent time with the teachers and reviewed the mandates of the school. The two agendas were A: Achieve excellent academic result at the GCE level and B: agenda of empowerment, to achieve self-directing and effective empowerment of the children. The purpose of the school is to foster academic and moral uprightness for high quality students. Small class sizes in an enriched environment allow students to explore, expand and refine the elements within the cultural construct to develop dialogue and cultivate leadership, invention and creativity. The school’s focus is on fast learners who are capable of leadership, social interest and ethical behavior. Since 2005, it has grown to over 130 students and continues to offer an enriched learning environment for Forms 1 through 5. Our students continue to perform well on their O-Level exams. The school building has grown as well, to meet the needs of the increased enrollment.